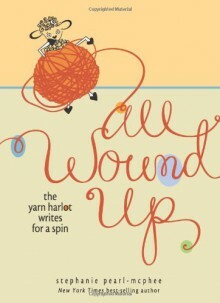 In this all-new collection of yarns, New York Times best-selling author and self-proclaimed yarn harlot Stephanie Pearl-McPhee is all wound up about life, motherhood, losing her beloved washing machine, and, of course, knitting. With the trademark humour and wit that have sustained her through thick and thin, including a few misshapen sweaters and an indoor water balloon fight among her otherwise darling daughters, Pearl-McPhee deftly examines knitting, parenting, friendship, and -- gasp! -- even crocheting in essays that are at times touching, often hilarious, and always entertaining. The sort of book I want to give several women - mothers, aunts, etc - in my life, because it makes me feel like they make me feel, until I remember they'd judge it for Too Much Knitting Content before ever cracking the cover. Their loss.